a. Go to “Domains” in MailGun. b. Click on “Add New Domain” button. c. Enter Domain name and click on “Add Domain” button. d. Added details should be displayed as below. e. Click on “Continue to Domain Overview” button. c. Add the TXT records for SPF and DKIM in the domain service provider for the domain. a. Login into Easysendy Pro. b. Go to Delivery Servers -> Select “MailGun Web Api”. c. Enter name as “MailGun”. 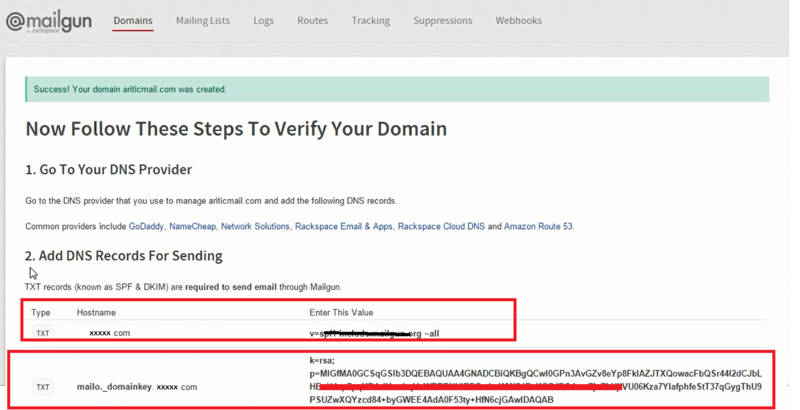 d. Go to MailGun login and Go to “Domain”:. e. Click on the domain. f. Paste as domain name in the EasySendy Pro. g. Go to MailGun page and copy API key. h. Paste API Key in Easysendy Pro. i. Enter From Email and From Name details. j. Click on “Save Changes” button. b. Go to Mail and open the email. c. Click on the link inside the email. d. The Server status in the Easysendy Pro should change as “Active”. 7. Confirm bounce and complaint files are setup properly. a. Go to MailGun -> Webhooks. c. To check the given webhooks inside EasySendy Drip (or EasySendy Pro), go to delivery server > edit the server > click on “Info” tab from the right corner of the screen. d. In the new pop-up box, you will get the details about how to setup the webhooks and the EasySendy Drip (or EasySendy Pro) links.